Luton midfielder Olly Lee insisted his side are the best in the division after they achieved promotion to League One at the weekend. Town’s draw at Carlisle United on Saturday, courtesy of Lee’s goal on the hour mark, meant they were automatically promoted to the third tier of English football. We’ve pushed on this season and in my opinion, we’ve been the best team in the league. However, it is more than likely they will finish as runners-up to Accrington, who could seal the title with a point at home to Lincoln City this weekend. But Lee, who was part of the Hatters side cruelly defeated in the play-offs by Blackpool last term, said: “We’ve reacted all season, we’ve had a lot of setbacks since the time I’ve been here when we really should have deserved better. “The play-offs was obviously a hard thing for everyone to take, but we’ve bounced back, we’ve used that as motivation. 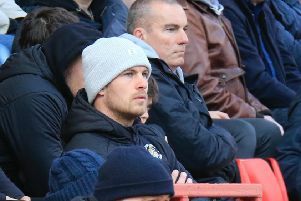 Although Town couldn’t put more pressure on Stanley, who thumped promotion hopefuls Wycombe 4-0 away on Saturday, Lee wasn’t overly worried by the draw at Brunton Park which virtually ensured Accrington will win the title. He continued: “No, not really. We came here for three points, that’s what we wanted, we want to keep putting pressure on Accrington. “But a point got us up and the aim at the beginning of the season was promotion, anything other than that is a bonus. “We’ve had the clearer chances and probably should have got the win, but it’s not something we’re going to dwell on. “We’re going to enjoy tonight and this is what we’ve worked all season for, we’ve done it for the club. “We’ve got Luton to League One and we’re all immensely proud of that. “It’s massive, the first promotion of my career and we’ve stuck together. Lee now believes that Town can follow in the steps of Burton Albion who went straight through League One at the first time of asking a few seasons back. He said: “Without a doubt, the only way Luton’s going is up. We’ve got a lot of very good players here, a lot of players who will be very good players in League One. “So we’ll enjoy this week, enjoy the end of the season and then we’ll kick on. “We’ve got the club back in League One and it’s one step closer to where they belong. “We know that’s where we should be, we’ve met our expectations really. We’re a very good side in this league and I think we’ll be a very good side in the next league.